And The Scams Just Keep Coming! 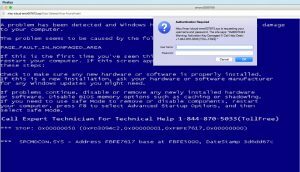 This scam just hit a client’s computer earlier this week. Don’t let a stranger tell you that there’s something wrong with your computer! It’s something that has happened to everybody; you’re working, minding your own business, surfing the web, and suddenly your reverie is broken. A window alerts you that there’s a problem with your computer; your data is going to be corrupted; all your browsing history will be displayed for everybody to see; or simply there’s a virus and it need to be fixed NOW! And just for your utter convenience, there’s a number to call for these honest and helpful folks to solve the issue. All major credit cards accepted. Sometimes it’s just a pop-up window; other times it hijacks your entire screen and there’s seemingly no escape. Either way, it’s a scam and should be aggressively ignored. Remember – no stranger should give you unsolicited advice that your computer has a problem that only they can fix. Think about it; somebody you don’t know and has no access to your computer should NOT know anything about your computer (other than a few inconsequential technical details.) So, assuming they can detect a virus or other problem is wrong; those are scams that should be ignored. If you DO call their number, you can easily tell you’re speaking to a call center located on the other side of the planet. The noise in the background is one dead giveaway; the accents of the agents is another. Most of these scammers are trying to sell you a solution to your “problem,” which just involves paying for a service you don’t need. But others are more devious; scouring your computer for sensitive information, including passwords to online accounts, Social Security numbers or financial data. Bottom line; don’t fall for the scam. At the first sign of ANY funny business, quit your browser and clear your browsing history. If the problem persists, switch to another browser. (Some of these scams involve the scrubbing of the preference files of your browser to get things back to normal.) If necessary, employ the services of a trusted computer professional. NEVER call these companies (much less let them gain access to your computer); once they get your phone number in their database, the harassment will never end. And since they’re largely overseas, they laugh at the mention of the National Do Not Call Registry or any threats of lawsuits.